Garlic is an age-old remedy for all types of ailments, with over 7000 years of history. Folk stories tell that it can be used to protect against demons, werewolves and vampires. While we cannot be certain about that, we do know that our little garlic stress toy can be used to get rid of all your pent up frustrations and anger. Squeeze it, bash it and smash it, you will soon be feeling a million times better and totally relaxed. Stress toys make trendy give-aways at corporate events, expos and product launches. 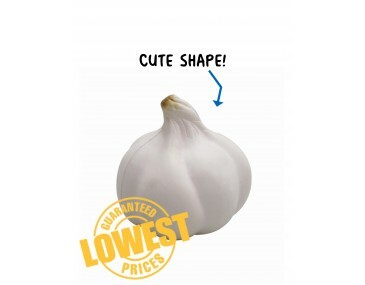 Make use of this fun garlic to add some flavour to your advertising campaign. Give your clients a garlic branded with your company logo that they will keep on their desks, at home, in the car or in their laptop bags. Our garlic looks totally authentic in a light colour with with a fat body enclosing the many cloves and a twisted stem at the top. Fruit and vegetable stores, fresh produce markets, farming enterprises and restaurants can make great use of these trendy stress toys. Speak to us about branding, our listed price includes branding of your logo or graphic in a single colour print. We offer a product turnaround time of two weeks, but we can offer even faster turnaround times for urgent orders. Please note that our prices exclude GST and a print set up of $75 applies. This product is supplied in bulk quantities and can be supplied unbranded if required. This item is available for delivery within Australia only.